A cruise along the Nile River is a must for first-time visitors to Egypt and the famous river is even more spectacular by night. 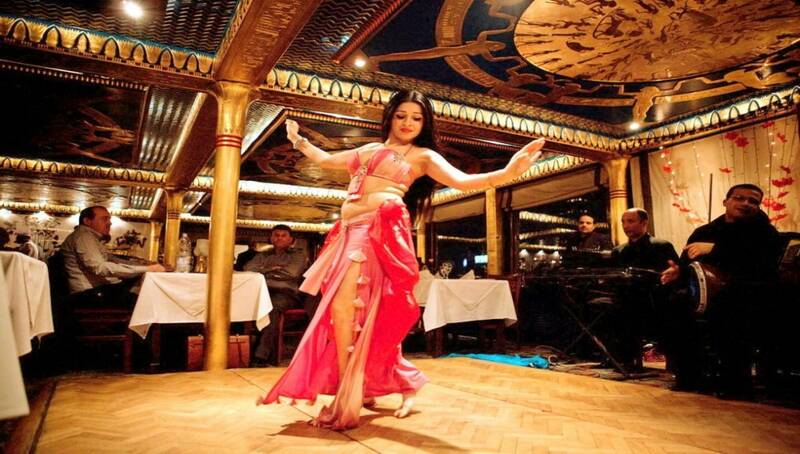 Set sail on this 2-hour evening cruise, tuck into a delicious buffet dinner on-board, and be entertained by live music, belly dancing, and a traditional Tanura show. At 6pm you will be picked up from your Cairo hotel to be transferred to the location of the Nile cruise at the bank of the Nile river. The Nile cruise departs at 7:15 pm, for a cruise duration of two hours. Enjoy the lovely view of the city during the sail. This night activity includes open dinner, and drinks are available to purchase. There will be a collection of entertainment shows including belly dancing, a Tanura show, and a band. Don't forget to bring your camera to take memorable pictures. Around 9:15pm you will be transferred back to your hotel.